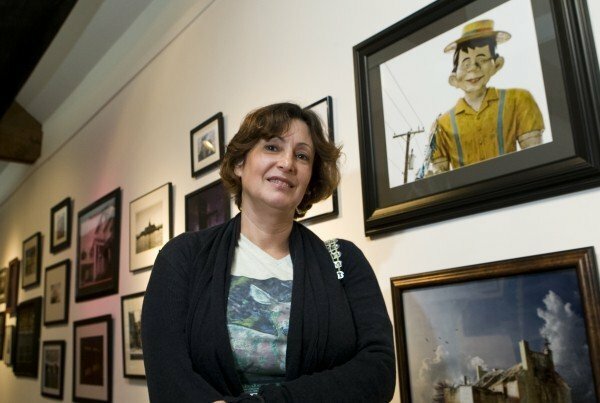 Janet Greco, a documentary photographer from Surf City, captured scenes of New Jersey weirdness that will be displayed at the Noyes Museum of Art in Galloway Township. A new collaboration between the Noyes Museum of Art and the magazine Weird N.J. showcased the strange in our backyard. How do you find the weirdest landmark on the horizon? A clutch of regional artists have converged on a local museum this month, displaying their entries in a photography competition. The twist? The show is a collaboration between the Noyes Museum and Weird N.J. magazine, the homegrown bible documenting strange things in our backyard - and curators were looking for a fresh perspective on the strange. Showcasing everything from the unlikely (say, pyramids of hubcaps) to the eerie (dilapidated hospital hallways), the exhibit runs until February and unites images of some of the remarkable sights and secrets across our state. But the venture marks a departure for the 15-year-old magazine, proving that its finders-keepers attitude to photography works as well on the austere wall of a gallery as on newsprint. Mark Moran, one of Weird N.J.'s publishers, says the magazine is routinely crammed with pictures - and its photo contributors are like bounty-hunters. "Our magazine wouldn't work unless everyone was prepared to share what they found," he said Saturday. Behind each shot, there is usually a road trip, a long search and a struggle for that trophy. Ask the photographers whose work was selected for this first-ever Weird N.J. exhibit, and they admit weirdness is hard to find, and even harder to catch on film. So says Janet Greco, a documentary photographer from Surf City, who left the region to work abroad but returned in 2003 and recently founded SouthJerseySightings.com. 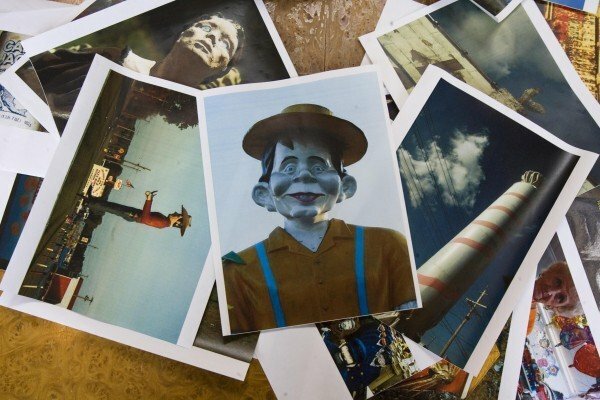 For the show, she captured the faces of concrete statues for sale in Tuckerton, the cartoon smile of the statue outside Mr. Bill's ice cream parlor in Winslow Township, Camden County, and a hole-in-the-wall cafe in Atlantic City where the walls are papered in dollar bills. To find her winning entries, the only road map she uses is her memory. "On my way home today, I saw a billboard at the side of the highway," she said Saturday. "It's always been decayed." That day, she saw it had been defaced - a thick layer of old pasted ads and lumber had been ripped off the front, revealing new decay beneath. "I absolutely braked," Greco said. That sort of thing may not make everyone stop, says fellow photographer John Arehart - but every New Jersey resident uses the state's weird-shaped buildings, signs and roadside decorations as mile-markers. He drives from his home in Glen Rock, Bergen County, to a Princeton office every day - and credits that schlep with his photographic success. "My commute became so boring that at one point I just started trying to take a different road, just for sanity," he said. "Now, at this point, it's like a challenge to find a new route and see what's down there." Along the way, he has found his way to some out-of-the way places - most notably the Greystone Park Psychiatric Hospital and Essex County Isolation Unit, where he shot his curated entries. "I have never had to break into any of these places," Arehart said, thinking back to when he walked into both facilities, pacing the eerily silent corridors. "Most of them are huge and sit pretty much unlocked, with little security." For those who want to road-trip the conventional way - along the beaten path - New York-based photographer David Franck says the Weird N.J. aesthetic has inspired a number of Web sites listing sights across the nation. In preparation for a book for preteens who want to spot strange sights along family road trips, Franck has been chasing down shots nationwide, often in 4,000-mile drives. For the show, he took a four-day road trip to Middle Township, where he shot the one-legged statue sitting outside Menz restaurant. "There's no vacation on my trips," he said. "I plot where I've been on a map and plan where I have to go next." With so many photographers criss-crossing the state in search of oddities, Moran says the Noyes show has been a chance to introduce some of the magazine's long-time photographers as well as others who have never submitted anything. "They all clearly share this love of the undiscovered," he said. "You never think why we don't all bump into one another - but we're all over the place." Atlantic City is known throughout the world, but you might not expect to see a photo exhibition about the resort in Barcelona, Spain.